Hello Everyone, I'm Lekhika Dugtal. I'm a budding designer and developer. Location : I belong from the place in a border area of India, Nepal and Tibet . Though Now,I live in New Delhi, India but due to my institute I'm living in Prayagraj. Enhancing the UI of plots2 while ensuring the consistency as per the information architecture of the project and do the relevant backend changes if required. Ideas and How to solve them. I tried to create some mockup designs. As being a designer and a developer, I usually came across easier designs than done on technical aspect. Its not that designing is easy , rather it needs a lot of work in thinking and analytical process. Many of the designs I used were designed by the publiclab's team earlier. The information was huge but the user centred approach with navigation and functionality in design didn't made it cluttered.Instead they were compact yet elegant. For those designs, I modified them a bit, I wrote down my approach and the method of implementation on how to solve them. All designs here are possible ideate-prototype-test process. I tried to keep the UI user friendly and as simple as possible. I tried implementing bootstrap ui and followed some the design blocks These are the two ideas I came up with after considering all the suggestions and discussions. I went for minimal searchbar with an added facility of filter available. Right now, we don't have the feature of search by filter at the beginning of search rather we can do it later after the results are displayed. Currently, The search on something is done after the results are displayed and then the tab is chosen. Instead I went for the vertical left bar, from the suggestions given in proposals of all the applicants. Here, we can have the vertical tabs as static ? It would be done using bootstrap search box and bootstrap vertical tab bars. Regarding the profile, we had so much data that it took me a ton of hours to think than in actually applying. The information was huge and regarding architecture I had no clue. I needed to ensure that I don't miss out anything. And yet with so much data, the UI doesn't look messy. So I came across a solution of controlling my information architecture with input-controls ie :toggle buttons. Why toggle button group ? With a toggle button group we can let user choose from two or more options available. Toggles are the best way to let users choose between two opposite options without the need of checkboxes and radio buttons.They are used for changing the state of system functionalities and preferences. This one consists of map !! This one have recent activity !! Both have it's own pros , So I'm planning on taking the best out of both of them on further discussion and implementing them. Considering the coding part, most of the work will be in css and html. The requests given are still the same. The key part here would be toggle-button-group, where if clicked on one icon, relevant group of items will be displayed and others will be hidden. and vica versa for others.The rest of the part will be almost same as only css will be worked on. I'll be using bootstrap4 and grid will be used to arrange the items. Bootstrap cards for the relevant tag information. The users are listed down in rows. It's usable but not user friendly. The search by location on map feature would help us to show the users in that location. All the users will be in form of cards - Why ? * The data includes text, images, actions and card layout will help the user to read more easily. * Filtering will be done by map, So it will look better to have a card layout. Here I tried to use full advantage of space given. The map spans whole width of screen. The very same map would be square in phones and rectangles in desktop with respect to screens showing the responsiveness. We'll be discussing to get the design which is best from both of them. All the users will be shown in the form of cards. The information shown regarding the ui will be discussed. There would be a button linked to profile of a particular user. So If there is need to go to user's profile and see the recent activity , then it can be seen. The positioning of map will be discussed with mentors and reviews. So for now, The implementation part is only for user list. The tags section will be divided into two column. The visualisation at right side will be shown in an iframe... I'll be using Bootstrap4 here. The card will be implemented for the tags. I'll be Modifying the Tags/Topics page to show cards instead of table rows. Right now I'm working of some of the break-me parts of this issue #5090. What else is needed ? Map to search and filter ? Filter info by places ? Filter people by places ? I was working to put some of my thoughts for dashboard then I came across this design in one of the comment section on notes. The best part of this design is that it's not less cluttered but it's less cluttered without sacrificing anything. For dashboard, It would grid layout into two-columns .The second column would be map where we can filter on the basis of location. The design would be compact but not cluttered. An elegant and clean design with a casual font is the solution. The discussions ,tags,questions followed , everything would be shown in form of cards. As cards are the convenient means of displaying content composed of different information and that's what our dashboard is doing .Its a feed to all the discussions. The card in dashboard will have direct post button and there will be icon on top left corner of card for unsubscribing. This lets us to have feature of unsubscribing without going to that tags page. If clicked on new post of that tag, The modal will open which will have templates to choose from based on need user have. There will be new bootstrap modal opening up for the follow more section. The UI has been made keeping in mind the needs of users. First you provide information to user regarding the tag with a collapse read more button which hides that section keeping in mind that there are many users who might not read it. After providing the information, the user is asked to ask a question and follow the tag below. The behaviour of user is observed here that if user will be interested,then there should be way to make engaging towards that tag with following and curiosity by asking a question. I modified the button group section with white buttons and light border. The tags page will be implemented using bootstrap 4. The section will be arranged using grid and multiple buttons in the middle will be implemented using a nested button group with dropdown component. The buttons will be linked to respective url. This was the latest design I found in the comment section for Questions page. It has a block design. The design is simplified yet cool. Input fields are sized according to their expected input they are both easier to read and to interpret for users. here the bigger size makes most of the filed values visible. It provides you information in the section above question area , thus making you clear of your aim to come in this url page. The Helpful information gives hints to users of the mottojust ask, we'll answer. To implement the UI mockup for the questions page, Bootstrap4 css and js will be used. The design itself is minimal with a form. The whole page will be placed inside a container and the profile picture along with basic description will be arranged in a single row by using grid. The description would be the info to make users realise that they'll get answers. The profile picture will have a tooltip implemented using bootstrap tooltip component. The questions data will be entered in a form which will have a single textarea input. The action for the buttons below the form will be executed by detecting their click event using jquery. The applications like Facebook,Twitter,Gmail, Slack, Zulip etc. 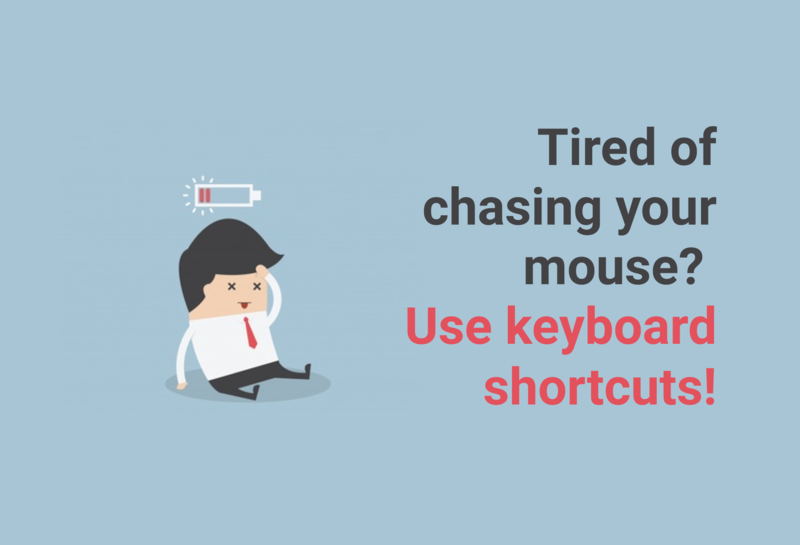 override the in browser keys like ctrl+s with their in application shortcut keys to provide a better user experience. 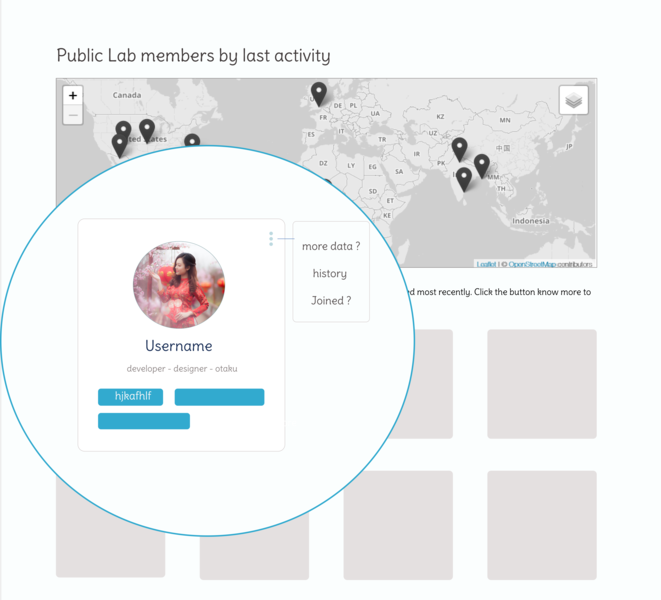 And considering publiclab has notes ,blog ,subscribe and many more features. This would be very helpful in future course. So Instead of taking our cursor to the point where we need it, it would be better experience to provide a very own set of shortcut keys. It might happen to override browser's default behaviour for a shortcut key to implement the shortcut key for publiclab, to prevent browser's natural behaviour from executing, e.preventDefault will be used where e is the event argument passed in the function. To make the code much better, instead of writing each shortcut key in an if block, a dictionary of keymapping will be maintained which will keep note of the keycode and a short name given to that shortcut key. Inside the keyhandler, a switch statement will be used to detect which key has been pressed and using the keymapping defined in the dictionary, final action will be executed directly or via a function call if required. For implementing the shortcut keys for ask a question, create a new research note and create a wiki, I propose the following flow: On pressing the designated shortcut key (say ctrl+k), a modal will open with the above mentioned 3 options, user can select one by navigating via keyboard and press enter to select that option. This will prevent implementing 3 different shortcut key for a create task of question,note and wiki. Remembering a single shortcut key instead of 3 will be easier for a user. Whenever the person creates a event. There is only one option given which RSVP for attending event. Rather there should be another feature for those people who are interested but unsure that whether they'll attend event or not. Usually there are many people who are not confirmed that they'll attend but they are very much interested in the event. So we can add feature where it can be shown the number of people interested in attending. A button interested will be placed alonside rsvp. Users interested in an event will use that button. In the backend a new field interested will be added to the database. Whenever a user clicks on the interested button, the interested field is updated on the database. The button will be added using bootstrap button with primary class. A new field interested in the respective table will be added alongside rsvp. On clicking the button, a request will be sent on the backend with the user detail who is interested in the event, the database will be updated accordingly for the user, finally a message "user is interested" in the event will be shown. Complete any unfinished work and write unit tests for the work done during the phase. right column and discussions on the left. Start working on the card layout. 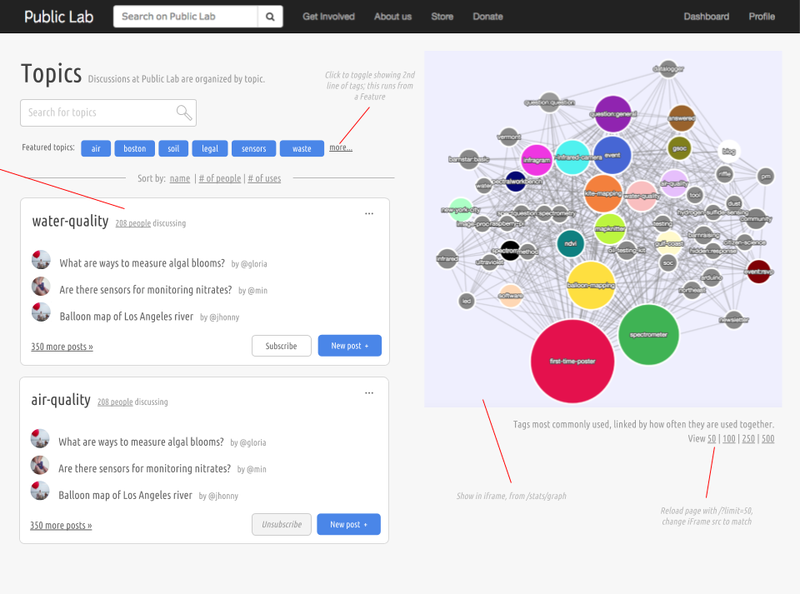 recommended topics, trending topics and the users nearby you. 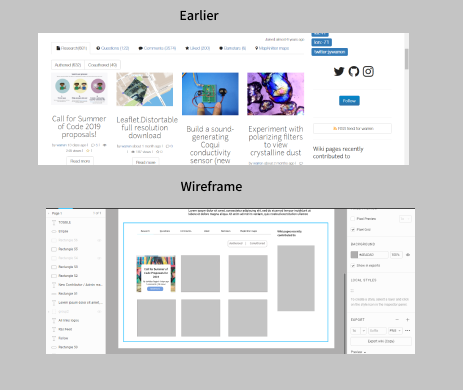 17 June - 23 June Work on feature of new modal for choosing a template and fixing up other issues. Work on feature of new modal for trending and popular topics. Start working on the tags section. Start working on results displayed in tags section. 1 July - 7 July Finish up the tags section, complete any unfinished work and write unit tests for the work done during the phase. Create the sidebar for the page. Working on toggle button group section which includes map, bio and recent activities. 22 July - 28 July Work on the tab pane which include research, questions,comments,liked and barnstars. Working on the card layout for the tabbed pane section. user to input the question. Start working on the featured question card layout. 5 August - 11 August Complete working on the featured question card layout. Work on browse questions across a range of topics section. 12 August - 20 August Complete any unfinished work and write tests for the work done. I'll review PRs , open FTOs and help other contributors all the time. I will keep contributing to publiclab after the outreachy period ends. I'll participate in discussions happening over the gitter channel and help other contributors. I'll keep contributing to publiclab projects by creating new issues and fixing the already present issues. I will review PR's and help out new contributors towards their first contribution. 1. All the unit test for code will be written in the final week of every phase. 2. Shadow testing for new UI of all the pages created. All documentation will be done in that phase only. Tell us how you've learned about writing software; what languages you've been learning, if you've worked on other projects, links to GitHub or other code repositories or samples ? The projects in semesters and the hackathons was the kickoff factor. ReactJs - I have only worked on small projects like todo and forum till now and haven't made a fully-fledged project on React Js yet. Mozilla's WebVR and Andoid Studio AR Core - I plan to work on a project based on AR/VR. Instead of going for fancy projects, I usually try to go for projects which solves some major problem faced by us and many other people in day to day life. Problem Statment : There is limited preventive healthcare and services to promote optimal health and wellness, and an avert worsening of one's healthy mind and body. Through this product we aim to make you "Not just disease free but also healthy". The backend server is implemented in django's REST framework. The forum is made using Hasura's GraphQL Engine and ReactJs. The frontend is made in JQuery and Bootstrap. The features of Webclient is present in the form of Zulip Bot. Problem Statment : The weaker students in schools and colleges face problems that cannot be solved by online resources and tutorials and needs a personal mentor. The portal lets the students upload their problems anonymously. The mentors bid for the problem. Thereafter the portal maps the student to the mentor for personalized sessions online/onsite. The services may be chargeable. The frontend is made in Ajax and Bootstrap. Problem Statment : An android based application.Pocket Police Companion aims to facilitate a hassle-free FIR lodging experience. Built on a portable app platform, E-Cop provides you an easy, on-the-go alternative to fast-track grievance redressal. Database used is SQLite Database. Problem Statment : Generate and Capture packets to create your own own dataset using jpcap and present it in raw or filtered manner through GUI. GUI widget toolkit (Swing) and IDE Netbeans was used. Automoji uses CNN and Bag-of-words Model to carry out sentimental analysis on natural language input to find its emotion and thus predict the corresponding emojis. Estimation of Photometric RedShift using Machine Learning - (work in progress) Using many machine learning algorithms to predict the photometric redshifts from spectroscopic values with the help of Sloan Digital Sky Survey dataset. I've participated in various hacakthons in a team of four where I worked as a designer and developer for a team. I've made some projects in the institute in a team of three. Here, I worked more in backend and coding part. I was a member of Design team of technical society of our institute. I worked with a team of 40 people for more than 6 months. I was part of Creative and Design team of the cultural fest of IIIT-A. At there I worked with a team of 50 for more than 8 months. I was a part of boot2root ctf - A Cybersecurity technical Event's design team. I created various designs for them. Winner of SheHacks Hackathon held at IIITA in Feb 2019. Second Runner Up in Hackathon called Hack36 at MNNIT in Jan 2019. All girls best team prize winner in Hackathon called Prototype organized by Headout. Top 3 in Nova - Designathon. What about our projects, and Public Lab, interests you? What are you passionate about? Open science, environmental justice? I came across Public labs when I had to decide my project in wireless sensor networks/wireless networks and one of the project idea was measuring the water quality, or the air pollution. I took the project because it seems doable to me but when I saw that there is an organisation itself which helps people measuring pollution and other to environment. It was surprising to be honest. The concept of working for the protection of Mother nature through tools and techniques of environmental science is the most novel idea I've ever seen. Whom do you want your work to help? We especially appreciate proposals which make technologies and techniques more welcoming and friendly to those who've often been excluded. There are hundreds of people visiting the website of publiclabs everyday. I want my design methodology approach to provide a better user interaction and experience. The improvement in UI will be done by understanding the human needs. So it aims to make user stay more on the website. The audience of this project will be all the users using this website to explore more about the environmental justice through science and tools. The great UI will help the users as a best tour guide, showing them around and making them interested. The UI need not to be unique but it would be conventional and easy to navigate. Recently I joined PublicLab but I feel like I was already part of this since years. One of the many best part of PublicLab org that everyone is so enthusiastic to first time contributors that you are overwhelmed to be of such welcoming organisation. It makes you feel to remain working for them in future even though you are just a newcomer. I'm really glad that I found this organisations and recognized the same organisation in list of outreachy. 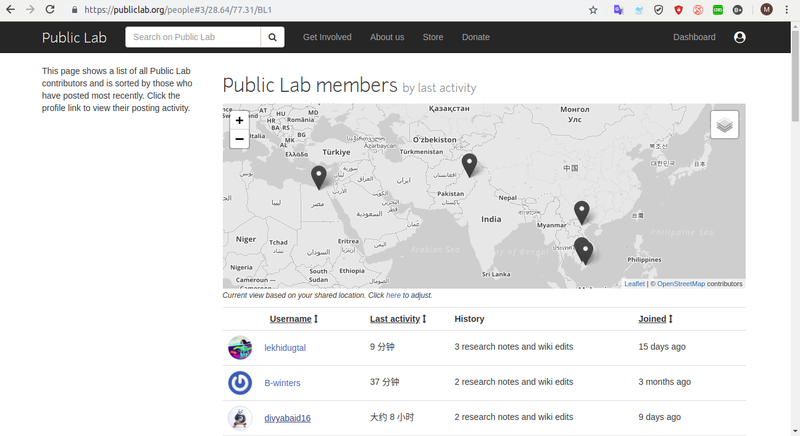 I would keep on contributing to Publiclab and help other newcomers. The environment I felt while joining this org for first time, I want everyone to feel this. I really like taking participating in discussions, so would love interaction and debate over the channel. Why so many vectors in proposal ? The proposal is for design and ui improvements. The way we are trying to improve the website with better design to ensure better user interaction. In a similar way, I tried making proposal more interactive and understandable through vectors. Hi everyone, This is Lekhika Dugtal. I've posted my soc proposal and would love to some feedbacks from you :) The proposal is still a draft and still under improvement. I was bit late in posting my proposal, It took me bit of time in empathising the whole problem and in processing the methodology. Thanks @jywaaren for mentioning out in one of the comments. I was bit under-confident and was still brainstorming regarding the draft, so I didn't post yet. Your advice encouraged me, I have shared the draft and would hope to refine this proposal with the help of all the reviewers and contributors. I really like the mock-ups and designs. They look nice. Really, well thought out proposal. Hi, reviewing here next -- i wanted to start by saying, I really appreciate what you said about ideate-prototype-test, and want to mention that we have a subscription to https://lookback.io, which we can use to regularly test out changes. 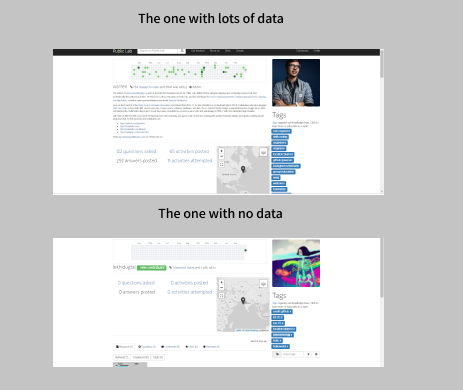 Often we publish pages as a "shadow interface" that can be turned on using a URL flag, or at a slightly different address, like https://publiclab.org/dashboard2, and then we can use Lookback to ask people to try them out, and watch the videos to see what goes well or poorly. They can be self-tests or facilitated in real-time by a designer. It's a good approach! In my latest attempt at the profile page mockup (in the shared design doc here: https://docs.google.com/presentation/d/1TCZoTfuhamRVrUak8aDgqJAwSgyhRtZg2Pgacl2_4zc/edit#slide=id.g4e2261b4b2_0_0) I tried making some of these into simply links, and not whole tabs, and relying on external pages to display them, rather than adding to the complexity of the profile page. This type of page is currently broken but we could debug it: https://publiclab.org/tag/coqui/author/zengirl2 (bug filed here). I hope this can help to address the excessive amount of information on the profile page! I also like what you're exploring with toggle buttons. As I mentioned to @IshaGupta, you could look both through Bootstrap styles and through the Froala Design Blocks for some conventional UI patterns that may be useful. As to the chart of "days of activity from the year", I honestly think we can probably skip it since it's not very active for anyone, and a bit discouraging for new users (or maybe for everyone given how sparse it is). Then, could we use a toggle button between the map and another display? Another idea for the profile bio information is to show the first paragraph but show a Read more link that hides more than that -- oh wait, maybe even just the first 300px or 400px instead of breaking on a paragraph. We could use a "fade out" effect to make it clear that there's more, as some sites do. Notice that we are using Leaflet (https://leafletjs.com) and Leaflet Environmental Layers for maps - we can style/customize quite a bit there! The Tag page design you referenced is the oldest of the redesigns we've seen, and hasn't been implemented yet. It has maybe too many blue buttons (since these call attention we want to use them sparingly) and perhaps we need to use some of the ideas from the newer design work at #ui to update this design. One thing that occurs to me is that we have the same challenge on the profile page as the tag page, currently -- lots of tabs for lots of different types of content. It's not ideal! We also could do better to feature curated content on the tags page, rather than just the most recent. Maybe that page could be modeled on a forum, in a sense? Lots of discussions under the topic, you know? Finally, I notice that when you go to a page like https://publiclab.org/tag/lead, you may not see the questions people have asked, but if you go to https://publiclab.org/tag/questions/lead, you may not see the posts. Is there a better way to be sure people know that even if there are few questions, there may be more posts, and vice versa? Finally in terms of timeline, i think the People page may be pretty simple and could be done earlier, potentially, and then the card designs for the Topics (/tags) and people pages could be re-used in the dashboard pretty easily. The Search pages are maybe the most in need of updating and they aren't super complex as designs, so we might push them earlier in the timeline too? The profile and questions pages are the pages with the most left to do in design work, so we might consider those later in the project, and leave time to think through them. Thank you so much for posting, @lekhidugtal and I hope this is useful feedback. I really appreciate how you're digging into UI issues across the site, and while the project we posted is aimed most urgently at completing implementation of the redesigns of key pages like Profile, Dashboard, People, Questions, Tag and Topics pages, I appreciate your eye for design issues across the site, as we're making a big push for improved UI everywhere 😃 -- great work! Hi Warren, Adding onto first, thank you so much for your response. I got some great ideas. Regrading search bar, I'm working on it. I'll go through the design of tags page and put some of my thoughts and ideas into it. The question of tag/lead or tag/questions/lead got me in thought. You analysis got me into thinking at various prospects. I'll push up the people's page and search page on timeline. I'll work on your suggestions, improve and update the proposal soon. Hello everyone, I've updated my proposal with all suggestions including search,profile,tags,dashboard etc. It would be great to have feedback from all of you :). Regarding, search bar, I liked the idea 2. Adding onto first, Thanks you much for your feedback Gaurav. I'm glad you liked the ideas and designs. I'll keep on improving my work. Hello @lekhidugtal, your proposal is impressive. Nice job! Thank you so much @tonchunks. Hi @lekhidugtal, you have written a great proposal though. I liked the mock-ups, detailed implementation and many other. I have some opinions to pitch in. I like the second format of search input. It looks pretty convenient according to user views. Are we deliberately doing the shortcut keys? As every other topic was related to designing in the proposal and this topic was the only one that was little odd one out. Also, did you considered to redesign the wiki page and the notes page a bit as that page was left out in this proposal. Otherwise, your proposal looks really good. 1. yeah Even I liked Idea 2 and will wokr upon it. 2. Regarding the shortcut keys, this is not included in timeline rather before and after that. It's one of my ideas that I proposed. As outreachy is for ui imporvements , so I haven't included it in outreachy timeline rather before that. 3. I did share one notes before it regarding visual difference between wiki and notes. And made one PR to begin the work on this. Nice work @lekhikadugtal. It would be really nice if you share the links in the proposal. And here is the PR, I'm still working on this and trying to get a better way to create a visual difference between them. Hi @lekhidugtal, Yeah, really nice work. It would be really nice you can just integrate these work done in this proposal. Thank you! !